Weatherson tried to smuggle drugs into HMP Durham. Pic: Google Maps. A visitor who smuggled 'zombie drug' Spice into a North East prison during a family visit has been locked up. David Weatherson tried to pass a package, containing the former legal high and some painkillers, to his cousin, who was serving a sentence at HMP Durham. The 30-year-old was detained by guards, who had spotted him acting suspiciously in the visitors hall of the jail on February 8. A small packet, containing the painkiller pregablin and the class B drug Spice - which has been the subject of police warnings about it's 'zombie' effects on users - was found in his clenched fist. 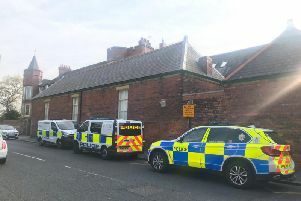 Weatherson, of Cross Parade, Newcastle, admitted taking prohibited items into prison. He was on a suspended sentence at the time. Judge Tim Gittins told him: "The effects, particularly of Spice, are all too well publicised. "Whether it was to be taken by him or used as currency by him, it causes severe reactions to the health and wellbeing of the inmates that take it. "Other inmates and staff have to be faced with people behaving dangerously because they have taken it, in any quantity." Judge Gittins jailed Weatherson for a total of nine months, and told him: "It has to go out loud and clear that people taking such items, particularly class A, B and C drugs into prison, will receive sentences of immediate imprisonment." Paul Caulfield, defending, said Weatherson had believed the drugs were 'legal highs', but knew he was taking a risk. Mr Caulfield said Weatherson had done well in working with the probation service after his last sentence and has recently undergone major surgery on a foot problem that requires follow-up hospital appointments. He added: "The defendant has been a fool."